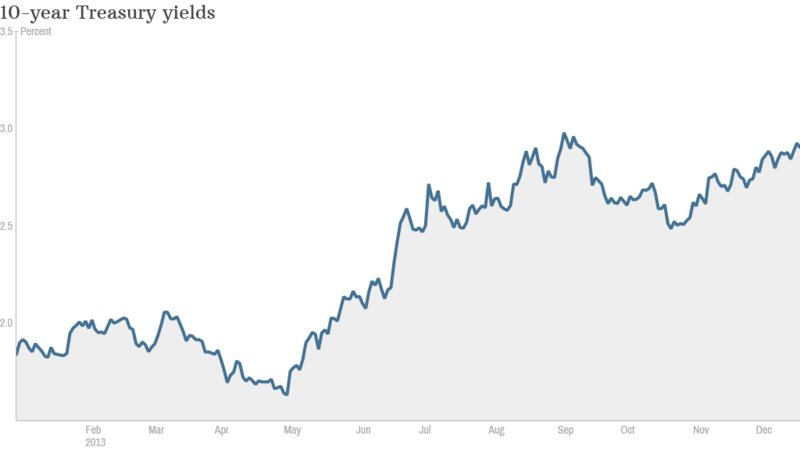 Bond yields spiked in 2013. But many experts don't expect another big surge in rates next year. Click chart for more on the bond market. It's no secret that 2013 was a rough year for bonds. The Barclays U.S. Aggregate Bond Index (LAG) has lost nearly 2% while the S&P 500 is up more than 25%. After pouring into these supposedly safe assets in the wake of the financial crisis, investors have already yanked a record $77.5 billion from bond funds in 2013, according to research firm Trimtabs. But the bursting of a "bond bubble" -- that dreaded scenario in which bond prices fall further and a sharp spike in interest rates would leave bond investors saddled with heavy losses -- never came to pass. Long-term rates are still relatively low. With the Fed finally beginning to wind down, or taper, its $85 billion per month bond-buying program, economists think rates will go higher next year. "There's so much of an expectation that rates are going to rise that it's going to become a self-fulfilling prophecy," said Jim Vogel, who oversees interest rate strategy at FTN Financial. But Fed chairman Ben Bernanke's announcement Wednesday that the central bank would begin dialing back its stimulus by $10 billion per month did little to move the needle on bond yields. Related: Is the economy as good as it looks? Matt Freund, who manages over $13 billion in mutual fund assets for USAA, thinks the market has already priced in more tapering. "We already went through this drill once," Freund said of the so-called "taper tantrum" earlier this year. "The markets are a quick study." However, the bond market's muted reaction Wednesday may have to do less with the taper, and more with the fact that Bernanke said the Fed would keep its key federal funds rate near zero for some time. Chris Gunster, head of fixed income portfolio management for U.S. Trust, forecasts a difficult year for bonds in 2014, but he doesn't think it will be catastrophic. He likens the market to a helium-filled balloon sitting on a ceiling. "Bubbles tend to burst, balloons just tend to glide down," he said. Of course, there is more to the bond market than Treasuries. Gunster recommends short-term corporate bonds that will be more insulated from interest rate movements than Treasuries. He also anticipates that mortgage-backed bonds, bid up by a hot housing market fueled by low rates, will become attractive in 2014. Freund is excited about municipal bonds, despite a highly publicized bankruptcy in Detroit and escalating fears of a Puerto Rican debt crisis. He notes that in many cities "taxes are going up and services are going down... that's rough for the people who live in the municipality, but very good for bondholders." But even if you have no interest in buying bonds for your own investment portfolio, it's still important to keep an eye on interest rates. Mortgages, auto loans, and credit card rates are all tied to various bond rates. And some economists have worried that higher interest rates could derail the still fragile recovery. The housing market, which has been a main economic driver of growth this year, could be particularly vulnerable to higher bond yields because that could push up mortgage rates. But Guy LeBas of Janney Capital Markets shrugs off those concerns. 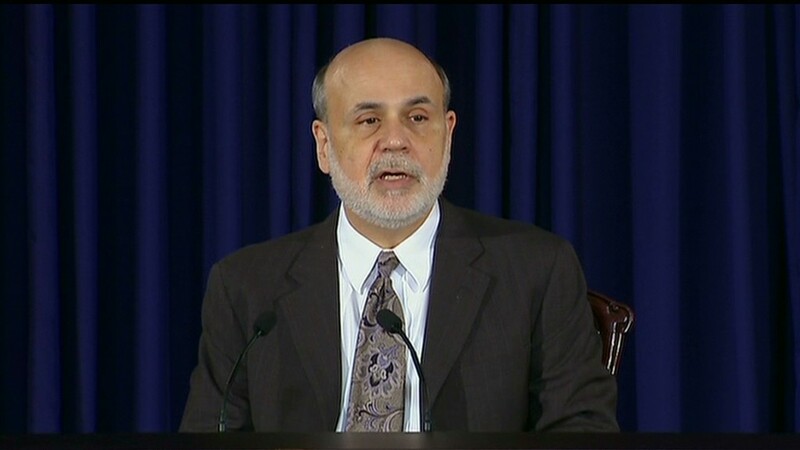 He envisions a 3.4% yield on 10-year Treasuries by the end of 2014, hardly a dramatic leap. It's also still a historically low rate. "The broad perception that rates are going to rise meaningfully is a dangerous perception," he said.